Thank you for reaching out to me regarding President Trump’s proposed border wall. I appreciate you taking the time to write and help me serve as your representative. President Trump’s insistence on a border wall to fulfill his uninformed campaign promise is a waste of taxpayer money, harms families, and does not solve the immigration issues we must address as a country. There are serious homeland security vulnerabilities that will not be addressed if the president is allowed to squander $5.7 billion on a border wall. This includes not being able to hire more law enforcement agents to focus on opioid, gang, trade, and child exploitation investigations. There will be no funding to hire additional customs officers to intercept illicit drugs and other contraband, almost all of which comes into our country through the ports of entry. And there will no increased funding for first responder grants to help states and localities better prepare and respond to terrorism and disasters of every kind. The president's wall would split communities such as the Tohono O’odham nation in half, disrupting families and centuries old traditions. President Trump has already terrorized communities with his Muslim ban, separated families at the border, and attacked immigration policies that disproportionally aid women and children. A border wall only further enables this administration's obsession with cruel attacks on immigrants and their families. What we need is to update our immigration system to fit the modern world. Immigration reform must be comprehensive, protect DREAMers and recipients of Temporary Protected Status, live up to our international human rights obligations, and show compassion to immigrants that contribute to their communities in the United States. I have voted to block the use of federal funding to plan the border wall and will fight the wall and all of President Trump’s abusive and inhumane immigration policies. I am proud to stand with you on this issue and hope to continue to represent you well in Washington. Again, thank you for sharing your thoughts on this important subject. Please contact me again in the future as Congress debates issues that we all care about. If you are interested in following my work for you more closely, please sign up for my newsletter here. 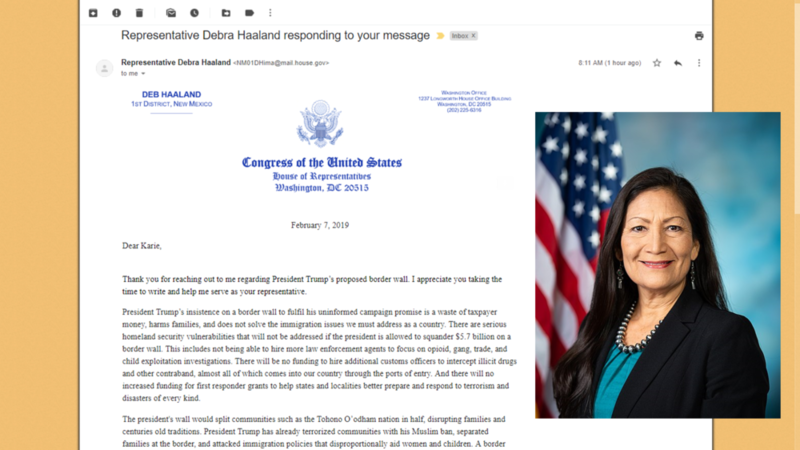 You can also follow me @RepDebHaaland on Twitter, Facebook, and Instagram. I look forward to working for you and hope to hear from you again in the future.